Lao Tzu said, "To see things in the seed, that is genius." As financial farmers we seek to identify opportunities that will provide us with the greatest return; with high returns, however, also come greater risks. A fine example for today's blog post is the "typical" Alaska placer gold nugget mine operation we see on such popular TV shows as "Gold Rush" and "Bering Sea Gold." As we begin this discussion, it is vital to understand the acquisition of the very land from which this tremendous physical wealth is mined; originally termed "Seward's Folly" after U.S. Secretary of State William H. Seward, the Alaska Purchase was triggered by Russia's fear of war with Britain. Still recovering from the effects of the Crimean War and having a heavy debt to pay to the Rothschilds, Russia entered into negotiations with the United States to sell what was considered frozen wilderness. Negotiations concluded with a purchase price of $7.2 million dollars, or 2 cents per acre. The check below changed hands on March 30th, 1867. America purchased an area twice the size of Texas and many in the general population considered it a barren wasteland. In 1896, however, the prevailing attitude changed as gold was discovered in Alaska. It triggered a gold rush which brought greater and greater numbers of prospectors, land developers, businessmen and scoundrels alike north to the virgin wilderness. Thus begins our discussion of placer gold mining and a link to our Invest Like A Farmer philosophy. The earth does not give up its gold easily, and as previously discussed on this blog, I equate gold with toil. There is no "red-tag" sale on toil, it is constant, unrelating, and always present in the struggle of life. That is gold, toil. As a frequent viewer of "Gold Rush" and "Bering Sea Gold," I fully recognize the difficulty the miners have in acquiring the end product of placer gold nuggets. Hundreds, if not thousands, of hours go into the planning, development, construction, shipping, training, mining, and processing of a single ounce of gold. There is no easy way to consistently and successfully mine gold. 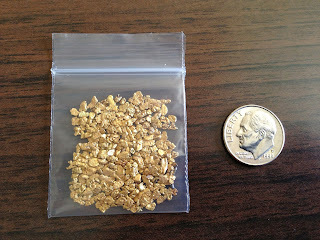 The vast majority of placer gold nuggets that are eventually acquired are generally small, even grain-sized. It is now rare to find large gold nuggets and it has even been said that a 5 ounce gold nugget is as rare a find as a 5 carat diamond. Why? The big nuggets have all been mined and there is increasingly less virgin territory to mine which could result in large nugget discoveries. From a fixed commodity asset like gold, with an increasing demand from a larger and larger population, this is quite understandable. The natural resources of precious metals and gemstones by their very definition should increase in both real and monetary value based on population growth, cultural demand, and difficulty in obtaining these resources. As financial farmers we then need to ask ourselves, from a utility and scalability standpoint, what investments do not necessarily have the constraints of a physical resource, yet provide similar increasing returns related to population growth, cultural demand, and difficulty in obtaining/creating these resources? I would argue the next gold rush is, and already has been, in the form of the internet, pharmaceuticals, and portable technology such as mobile phones, tablets, and to an increasing use smart watches. I see these three particular areas as having tremendous long-tail growth for anyone planning to Invest Like A Farmer; their respective scale and utility is nearly unparalleled. Gold, however, still has the timeless visual allure of a pure element, remains difficult to obtain, and has acted for thousands of years as a portable store of wealth. I have no reason to doubt the merits of this trend to continue.